Derick Rhodes is a footage content producer at Shutterstock. This post was originally published on the Shutterstock blog and has been adapted with permission. Duncan Frazier has made impressive stunning timelapse footage, but when he and his business partner Stephen McGuigan (working together as Bitbanger Labs) sent us a link to Pixelstick, we experienced the kind of awe that was formerly reserved for Apple product launches. 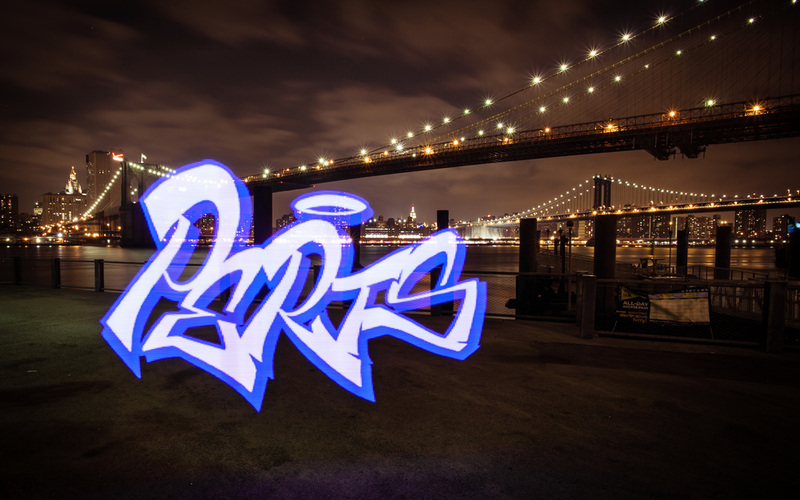 Pixelstick is a tool that will allow photographers and videographers to bring a totally new dimension to their work, giving them the ability to “paint” virtually anything they can imagine across the span of a timelapse video or photograph. 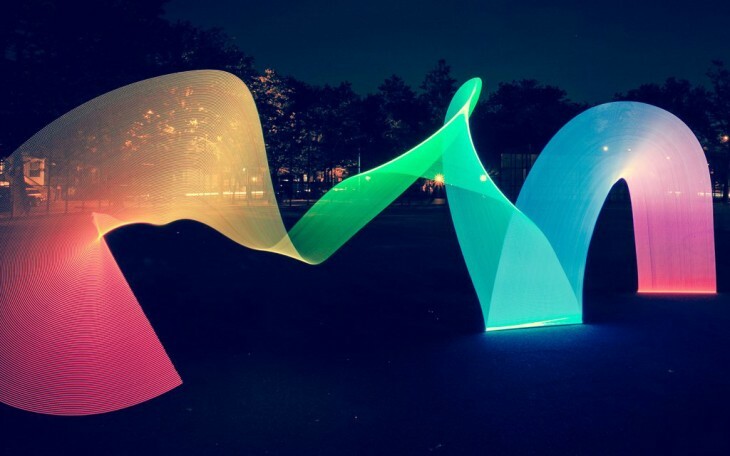 We met Duncan and Stephen at a waterfront Brooklyn park, where they graciously demonstrated Pixelstick in action and Duncan answered our questions about the soon-to-launch invention. Shutterstock: How did the original idea behind Pixelstick come about? 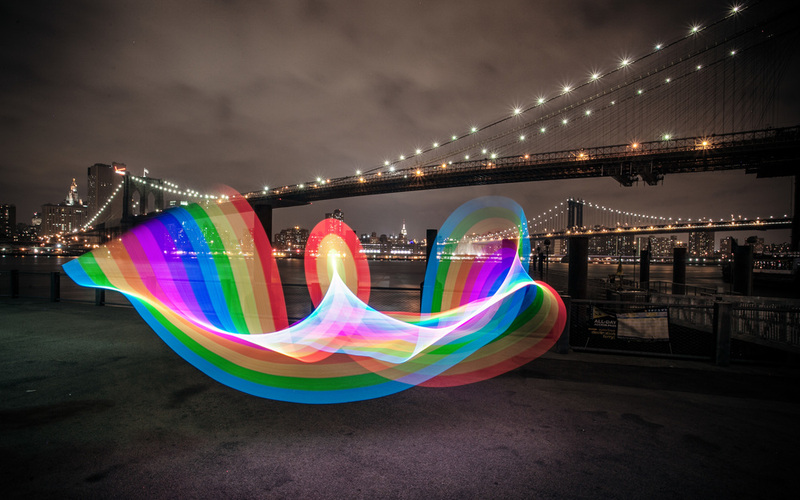 Duncan Frazier: We’ve always been avid light painters (and timelapse lovers), but we were never quite satisfied with the fidelity. We started thinking about ways we could use our tech backgrounds to possibly produce more interesting, high-quality results. Early prototypes functioned as proofs of concept, but the quality we sought still wasn’t there. That’s when we moved to custom circuit boards with a much denser LED layout, and Pixelstick began to take shape. Shutterstock: The moment we saw your invention in action (via your Kickstarter video), we started thinking about a wide variety of things that would be fun to try out. How much time have you had to experiment with the prototype so far? Have people gotten in touch with concepts for which Pixelstick might be well suited? Duncan Frazier: Pixelstick has been alive, in some form or another, for well over two years, and we’ve been shooting with the current prototype for a few months now. Early on, we were just getting comfortable with Pixelstick and slowly refining things to make it more usable. Once we were more dialed in on that front, it allowed us to focus on technique. We were pretty stunned at the range of things we were able to do with Pixelstick just in our video, and we’re quite certain we’ve only scratched the surface of what’s possible. We’re excited to see what other creative folks can create. Shutterstock: Will exceeding your Kickstarter goal change the version of the product you expect to release? Duncan Frazier: We’re always pushing to improve our design. Right now, we’re pretty happy with the path set before Pixelstick. It was always meant to be larger animal, whereas we went into our previous project with the supposition that we’d be hand soldering a couple of hundred boards ourselves. It was only the overwhelming and unexpected response that forced us to completely rethink the idea. Shutterstock: How did you decide on 198 pixels for the height? In theory, could you make significantly taller Pixelsticks, or allow for multiple Pixelsticks to be combined in some way? Duncan Frazier: In theory, yes, in practice, no. Power immediately becomes an issue when you talk about daisy chaining or stacking. Multiple independent sticks could certainly be fired simultaneously with the same remote, which is an intriguing idea that we’re excited to explore.